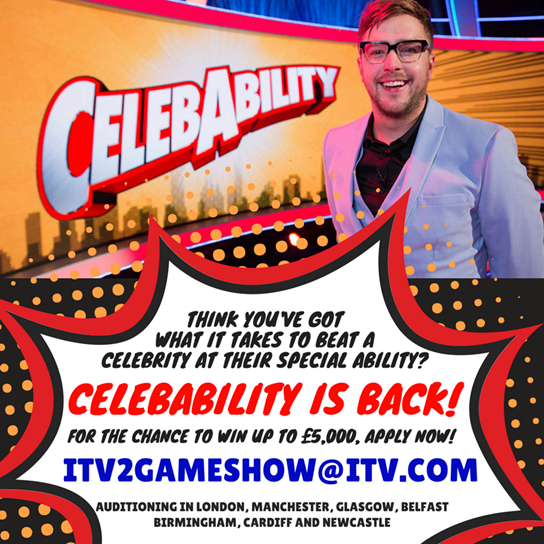 CelebAbility Returns To ITV2- Do You Have What It Takes? CelebAbility, TV’s most chaotic and crazy show returns to ITV2 later this year for a second series in its continued quest to discover more unique skills and abilities possessed by celebrities. After a successful first series (the youngest profiling new show on the channel – 62% of viewers aged between 16-34), series 2 has been extended from 6 episodes to 8. The comedy entertainment show from Potato (makers of Ninja Warrior and The Chase) is from an original idea devised by Mor or Les Productions. Hosted by the voice of Love Island, Scottish stand-up comedian Iain Stirling who is joined again by his trusted adjudicator Marek Larwood. Hoping to win £5,000, a group of friends will go head to head with celebrities in a series of uniquely crazy rounds. All of which are based on the unusual skill or ability that the celebrities believe they naturally possess. CelebAbility highlights from the first series included MiC’s Stephanie Pratt reading a dog’s mind, Olympic Medal winning gymnast Louis Smith attempting to eat a poppadum as quietly as possible and “always lucky” Joey Essex picking the right pigeon to be pooped on. Other guests included Laura Whitmore, Vicky Pattison, Pete Wicks, Maya Jama, Keith Duffy, Ed Gamble, Vogue Williams and Megan McKenna. “CelebAbility is back and I cannot wait! Celebrities doing tasks against the members of the public – who will come out on top?” says host Iain Stirling. Do you think you have what it takes to beat a celebrity? The team are currently looking to cast enthusiastic competitors like you! Email itv2gameshow@itv.com if you are interested. CelebAbility has been commissioned for ITV2 by Paul Mortimer, Director of Digital Channels and Acquisitions and Saskia Schuster, ITV’s Comedy Controller. CelebAbility is a Potato production from an original idea devised by Mor or Les Productions. Executive Producers are Phil Mount and Michael Kelpie, Aaron Morgan and Les Keen. Ben Hardy is the Director.